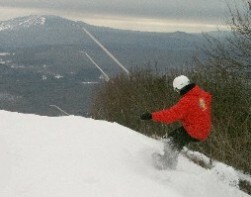 Bromley Mountain, Vermont, one of the Fairbank Group ski resorts in New England. HANCOCK, Mass. – As the start of the 2017-18 ski season has begun, the Fairbank Group of New England ski resorts – Bromley Mountain, Cranmore Mountain Resort and Jiminy Peak Mountain Resort – officially launched airline-style variable lift ticket pricing for skiers and riders able to plan ahead and purchase tickets online before they arrive. Discounts of 30 to 50 percent off the walk-up ticket window price represent the resorts’ largest lift ticket savings ever offered and provide substantial savings in exchange for a non-refundable/non-transferrable advance sale ticket purchased online. Visitors access the resort website, click the pricing calendar, then select their age group, number of tickets required, and specific days between now and April 2018. After approving the itinerary, they check out and receive email confirmation to present to the ticket window upon arrival. The percentage savings on holidays and weekends are slightly less than midweek rates. Similar to airfares, lift ticket rates may expire, sell out or be priced higher the closer you get to your visit, and advance tickets are limited, according to Michael Van Eyck, assistant general manager of Bromley Mountain in southern Vermont. “We want to reward skiers and riders for planning ahead and committing early. Advance sales also provide us with a projection of how busy we will be on any given day,” said Van Eyck, who reminds skiers and riders to check the websites of each resort for specific restrictions. In this case, the earlier you plan the more you save. The Fairbank Group, LLC, based at Jiminy Peak and co-owned by the father-son team of Brian Fairbank and Tyler Fairbank, manages and oversees a group of businesses that include the ski resorts Jiminy Peak Mountain Resort, Cranmore Mountain Resort and Bromley Mountain, as well as SnowGun Technologies, EOS Ventures, Bullwheel Productions and other endeavors. For more information visit Fairbankgrp.com.